Ah, l’Alpe d’Huez … books have been written about this mountain. I cannot think of a more beautiful stage of any Tour de France than those that finish atop l’Alpe. From Fausto Coppi’s win on the maiden stage in 1952, to Greg LeMond’s battle with Bernard Hinault in 1986, to Andy Hampsten’s solo excursion in 1992, to Pantani’s devastating attacks in 1995 and 1997, to “The Look” Lance Armstrong gave to Jan Ullrich in 2001, before attacking to win the stage and take the yellow jersey. 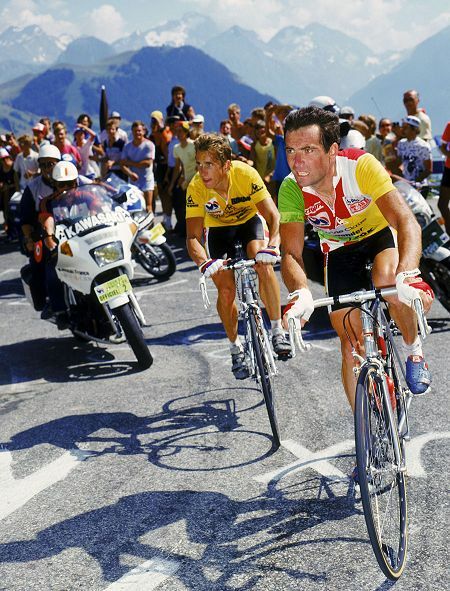 In all but 5 of the Tours de France during which a stage has concluded on l’Alpe d’Huez, the person who wore the maillot jaune at the end of the stage went on to take the final yellow jersey in Paris as the winner of that year’s race. It’s no wonder that this mountain has the reputation as the most difficult climb in the Tour. Sure, there are longer climbs and steeper climbs, but no mountaintop finish carries as much prestige as the Alpe … and there have been no unworthy winners of the stage. In this year’s Tour, the only active rider to have won atop the Alpe d’Huez is Frank Schleck, who won the stage in 2006, during Floyd Landis’s ill-fated Tour de France win. Frank is wearing the yellow jersey today. Will he still be wearing it at day’s end? Will he be able to get away, and win the stage again (and the Tour, for the first time)? Oh, I wish I didn’t have to work today. I can’t wait to watch the DVR coverage this evening when I get home.